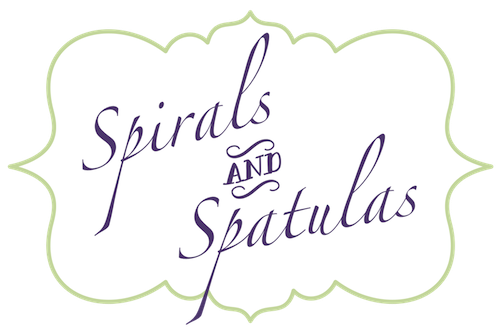 Spirals & Spatulas: An Entire Restaurant Devoted to Mac & Cheese?!?! An Entire Restaurant Devoted to Mac & Cheese?!?! First of all, don't forget to enter this week's giveaway! Last weekend our friends Dan and Kristen came into town to take their engagement photos, and we got to hang out with them for a while. The guys tricked Kristen and me into watching The Patriot. They failed to tell us that it was three whole hours of spurting blood and knives and guns. After two hours had passed and there were still no signs of the Revolutionary Army winning against the Redcoats, I grabbed Jeff's phone and Googled "the patriot length," only to find that I still had another hour to go. NOT on my recommendation list. Haha. But BEFORE the three-hour movie, we went to dinner at a new restaurant called Jus' Mac. This place serves macaroni and cheese. About twenty variations of it. It's kind of the coolest thing ever. 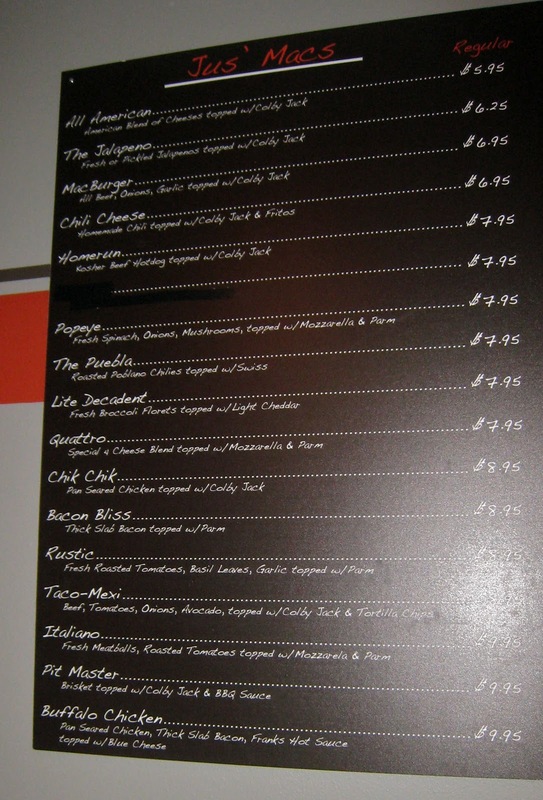 The Macaroni Menu! 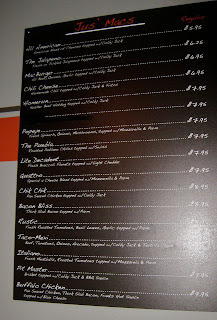 They have a few soups and paninis as well, so it's not JUST mac n' cheese. We each ordered a different one, and they were all good! They come in individual cast iron pans which hold WAY more pasta than it looks like they do! It was hard to finish half of it! Haha. Dan's buffalo chicken macaroni & cheese - SO CUTE that they serve it with carrot and celery sticks! Kristen got one with spinach and mushrooms in it, but I don't have a photo! We were pretty excited about the whole concept of this restaurant. Houstonians - you've got to give this place a try! Everyone else - isn't this the coolest thing ever!??! Oh my. I DEFINITELY need to go here! If only I lived within 20 hours or so... Ha. :) Looks delicious!! My friends and I were literally JUST talking about this place last night and how we need to go soon. This just further justifies our need! Uhhh, that sounds SO good. I could eat mac and cheese pretty much every day! This restaurant looks amazing! I love mac and cheese! that looks like such a fun place! we'll definitely have to try it the next time we're in town. I can't believe I had forgotten about that place! When it first opened we were dying to go because I LOVE mac n cheese. Putting on my list of things to do!